A 19th-century English hymn. The words were written in 15 minutes by Sabine Baring-Gould in 1865, and the music was composed by Arthur Sullivan in 1871. The hymn's theme is taken from references in the New Testament to the Christian being a soldier for Christ. 2 Timothy 2:3 : "Thou therefore endure hardness, as a good soldier of Jesus Christ." William Lee Lewis, Billy Lewis, marched into Heaven at 12:10PM, March 21, 2019. 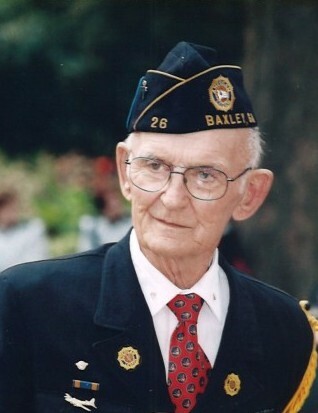 As a devout soldier of Christ, Billy lived 93 years as a strong man, a son, brother, husband, father, friend, businessman, and as a champion for the old, the “shut-ins”, the sick, the nursing home friends who needed someone to love them, to encourage them and to bring laughter and hope into their lives. Billy's life companion of 65 years, Betty Lewis, went to be with God 10 months before her husband. Betty and so many others were waiting at the gates of Heaven to welcome him. The promise of Heaven is real and those who believe as Billy did, are made whole again without illness and earthly challenges. Oh, what a wonderful reunion for Betty and Billy! Billy served his country during WWII by joining the Army Air Force when he was 18 years old. Billy was a waist gunner in a B-17 named, “The Lone Angel”. He endured hardness, he survived more than 40 missions in the European theater. The battle scars made their permanent mark on Billy and he fought the memories of war for the entirety of his life after the war. He was indeed a Christian soldier. Billy is survived by his 3 children, Jeffrey Lee Lewis of Baxley, Georgia, Jill Lewis Kirby of Raleigh, North Carolina and John Campbell Lewis of Baxley, Georgia. 3 grandchildren, William David Kirby of Detroit, Michigan, Levi Benjamin Lewis of Portland, Oregon and Blake Elizabeth Lewis of Santa Fe, New Mexico. 2 great grandchildren, Claude River Kirby and Linus Jules Kirby of Detroit, Michigan. Billy was fortunate to have a host of family members who loved and cared for him. He loved them as well. Anyone who knew Billy knew that he loved a good joke and he loved to laugh! One of his favorite lines was when he was leaving an event …. He would always say, “Oh, one more thing ….. Bye!” Billy has said “bye” to his earthly life and has gone to join the angels in Heaven. Onward Christian Soldier! You have fought the good fight. It is time now to rest. A Celebration of Life Service will be held Tuesday, March 26, 2019 at 1 p.m. from the chapel of Nobles Funeral Home and Crematory. A reception honoring the life of Mr. Lewis will follow the service in the Strickland Room of Nobles Funeral Home and Crematory. A graveside service will follow at 4 p.m. in the Omega Cemetery with military honors. Nobles Funeral Home and Crematory is honored to serve the family of Mr. William Lee “Billy” Lewis.